Science, Technology, Engineering, Art, and Math come together in tours and programs designed for your students. Our educational programs are aligned with Common Core and Next Generation Science Standards so we can help you meet your content needs. 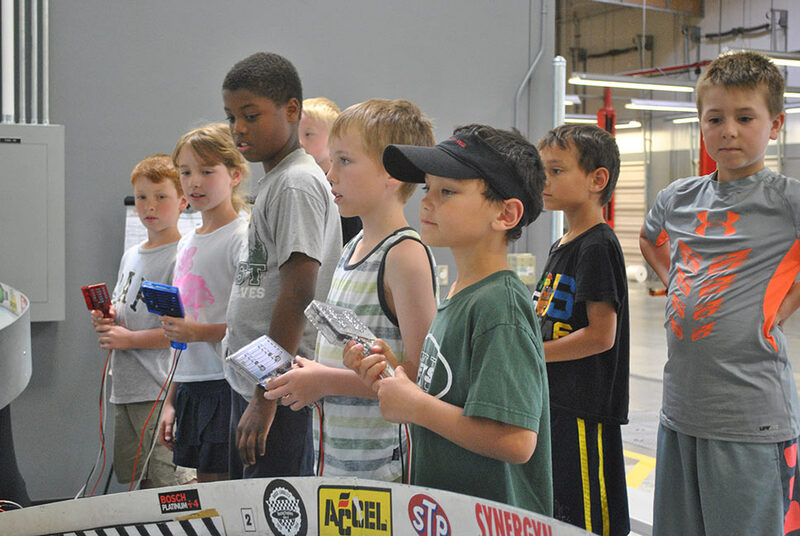 School visits to World of Speed include a guided tour with one of our museum docents and time to explore on your own. You can also add a hands-on workshop for your students, exploring physics, motion, energy, and more! Join the World of Speed education staff as you explore the Science of Racing! 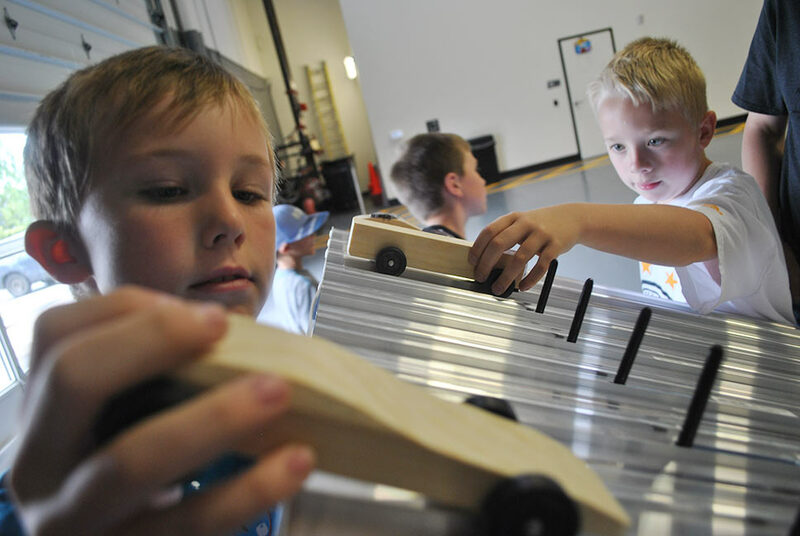 Students will make observations about a variety of Pinewood Derby cars, discussing design, weight, and shape, and then predict which one will finish first. After that, engineering takes center stage as students work in collaborative groups to design their own race cars. Which team's car will reign supreme? It's all in fun as students learn about energy, momentum, forces, motion, and much more! This workshop addresses a variety of Next Generation Science and Common Core standards. Be sure to check out our Curriculum page for more details. Explore our current exhibits and see what your guided tour will include. Request a date for your visit to World of Speed now! Simply fill out our reservation request form and we will contact you to confirm your visit and work out the details of your exciting adventure into the World of Speed. Please schedule your school trip a minimum of three weeks in advance; special consideration may be made with less notice, but we cannot guarantee a place in our schedule. Is there anything specific you would like to cover during your visit? Teachers and 1 chaperone per 8 students are free, each adult after that is the adult group rate. Payment can be made ahead of your tour or the day of with a credit card, cash, or check. If paying with a purchase order, please submit a copy of the order ahead of time if possible. Please schedule your school trip a minimum of three weeks in advance; special consideration may be made with less notice, but not guaranteed. *Recommended chaperone ratio is 1 per 8 students. Chaperones up to this ratio accompanying a group are admitted free of charge. Share information on your visit with your chaperones and parents by printing our World of Speed Chaperone Guide. We’ve made shopping easy for you! Pre-purchase your World of Speed souvenir packs when you schedule your tour, and take them with you when you leave. Souvenir packs are available at different price points, ranging from $3–7, to fit different budgets. Be sure to ask about packs when scheduling, or contact our shop directly to work out details. The cars displayed at the World of Speed are extremely valuable and one of a kind! As with any museum, please remind your students to respect the exhibits and not to touch. Please take extra care when looking closely at the vehicles. Stanchions are placed near the vehicles to protect them. Please do not lean on the ropes that connect the stanchions, or they may fall over and damage the cars, or — more importantly — may injure a student. They are very heavy. Ouch! Assign your chaperones to small groups of students ahead of time, and make sure they stay with their group of students throughout the visit. For more chaperone tips, please print and distribute our Chaperone Guide found at the link above. Please no food or drink in the galleries. If you are eating lunch at the museum, please let us know ahead of time so we can reserve an area for your group to eat. Have fun! Ask questions, find your favorite car, and come back again to check out our new and ever-changing exhibits!